Offering you a complete choice of products which include goalzy wwe bag tag, goalzy wwe wrist band, goalzy wwe tazoo, goalzy wwe magnet sticker, goalzy wwe finger puppet and goalzy wwf collectable cube. Usage : Advertising, Promotional Gift For Children Purpose. We are leading manufacturers of Goalzy WWE Wrist Band. 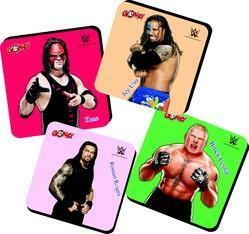 Looking for WWE Promotional Items ?